Luck O’ the Irish Suite-Deal Package Sunday through Thursday during the month of shamrocks and St. Patrick’s Day, you can save some “green” by staying 2 nights and getting the 3rd night free. Holden House boasts beautiful suites with tubs for two! To celebrate the Luck O’ the Irish, Holden House 1902 Bed & Breakfast Inn, located in Colorado Springs, is offering a Suite-Deal during the month of March when you stay Sunday through Thursday nights. Stay 2 night’s at full price and receive the third night free. There’s no need to search for the pot o’ gold or the end of the rainbow, since guests who stay in any of the inn’s six beautiful guest suites can take advantage of this discount package to save some green, a special that’s sure to please even the most demanding leprechaun. This package also treats guests to a delicious full gourmet breakfast each morning served in the elegant formal dining room, complimentary afternoon wine social and 24-hour coffee/tea and bottomless cookie jar. The Holden House inn’s romantic suites boast fireplaces, private sitting areas, private baths and soaking tubs. All of the Holden House suites also offer the option of a breakfast ensuite “Romance Package” for an additional $15 per day to enjoy your gourmet breakfast in the privacy of your own room. 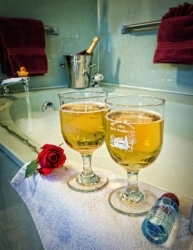 Help us welcome you and Springtime in the Rockies to Colorado Springs with added amenities to keep love and romance blooming all through March. Visit www.holdenhouse.com to make a reservation now and take advantage of this super savings stay. This entry was posted in accommodations, accomodations, anniversary, award winning inn, bed, bed and breakfast, bed and breakfast inn, beer and breweries, blog, breakfast, breakfast in bed, discount, discount offer, discounts, holden house 1902 BB, Holden House 1902 Bed and Breakfast Inn, Holden House bed and breakfast, Holden House Bed Breakfast, holdenhouse.com, holidays, March, Mid Week Discount, st patricks day parade and tagged blog, colorado springs, discount, getaway, holden house 1902 bed & breakfast inn, Irish, lodging, old colorado city, Shamrock, special offer, St. Paddy's, St. Pat, St. Patrick's Day, St. Patrick's Day Parade by admin. Bookmark the permalink.